Join us for the new Valentine’s Day (Weekend) tradition! Known for its romantic vistas of San Francisco and the Bay, our Bay Breeze race sets the stage for romance, whether you are in love with running or not. All race distances start and finish at the San Leandro Marina Park! Whether you are a frequent race winner or a first-time runner/walker, you’ve got a lot to look forward to. All participants will enjoy a mostly-flat, easy bayside trail that rarely strays more than a few feet from water. A perfect course for those looking to set a personal record! The half marathon distance will have pacers thanks to the TriValley Running Club. Flat and paved for first 3/4 mile or so. Then, small gravel like trail. Out and back basically. Bay/water views. Playgrounds/park for family waiting. Ideal race for running with stroller (if desired). Great people. Great medals. A valentine’s day (and cephalopod) themed run. Amazing bay views, easy flat out and back course. Even fighting a headwind for half the course didn’t put me off. As always Brazen puts on a great event – best medals, t-shirt designs and course support of any race series I’ve attended. Nice course along the bay. The first 2-3 miles are paved with the majority of the course being gravel trail. Easy flat course. It rained race day and it can get a bit windy being so close to the bay. My only negative is that the tents/booths and start/finish line were on the grass. Super muddy!! Didn’t expect a PR since I basically had to walk through the start/finish. I wore a hydration vest so I didn’t have to stop at any fuel stations along the course but I heard they are great. Post race treats were plentiful and with a very good variety of snacks. Thought it was cool finish times were printed and posted up fairly quick. Medal was really cool but didn’t differentiate distances. I would run this race again! Nice view, flat course, very fun race, I really recommend it , although it was very cold and rainy/ windy on the race day, still great course to run. This is a great flat race course. Brazen provides great support, gives great directions before race day so there are no surprises and they provide the nicest medals. Loved it. This is one of my favorite races. The 10k is a quick jaunt through the bay trails, with a view of the marsh on one side, the bay on the other. There’s never a shortage of porta pottys! As always, Brazen’s end of the race snacks can’t be beaten! The only thing I’d change is to have more vegan-friendly options. Before I went vegan though, the It’s It’s where my favorite! I’ve done the 5k and the 10k. 5k you stay pretty close to “home” and you run this one mile loop out into a peninsula in the bay that’s very pretty, then down the coast far enough to make the distance work out and then flip it around and back to the start. The 10k is more of a normal out and back. The half you make it almost to the Hayward Shoreline interpretive center. Brazen is always awesome, usual great food and shirts and medals. No surprises there. The course is pretty narrow at places, especially when runners are coming from the other direction. Beautiful views of SF in the distance. Can get pretty muddy when there’s rain. Great medal and race shirt. And great snacks waiting for you at the end! A great location for a first half marathon (or any event). Brazen put on a great event with pacers at a great location that follows the bay so there is plenty of wonderful scenery to distract the mind. The post race food was also very good and the medals from Brazen are always nicely designed. Event & Course Description: Brazen Racing’s Bay Breeze starts and finishes in Marina Park in San Leandro, with half marathon, 10K, and 5K distances. I did the 10KI, but have also done the half marathon in the past. For 10K and half runners the course is easily described: head south on the Bay Trail and turn around at the designated point to head back to the finish. The 5K course adds a ~1mile loop around a small peninsula which the other distances do not do. The half marathon course is about half paved, half packed dirt and crushed gravel. The 10K course is about 2/3 paved. Much of the paved trail has shoulders of packed dirt and gravel. The course is basically flat. One side of the course is almost always the bay. The inland side is mostly marshes, with about a quarter of a mile going past a housing complex. There are a couple of bridges along the course. Personally I’m more inclined to rocks, cliffs and breakers for sea views, but the views along the Bay Breeze course are very peaceful, and may include views of the bridges crossing to the San Francisco Peninsula (weather allowing). Over several years, the weather for Bay Breeze has varied from sunny and relatively warm to very light rain and somewhat windy. There is basically no shade on the course. 2019’s running saw light rain for the half marathon starts, and very chilly wind. The rain had stopped when 10K and 5K runners started (guess who checked the weather forecast for rain, but not the temperature forecast … and wore a short-sleeve Tee!). Outbound, the wind was almost directly in runners’ faces. I noticed it less inbound but can’t say whether it had lessened or was less annoying coming at my back. Organization & Production: Bay Breeze is one of Brazen’s most popular races, with over 1300 finishers of the three distances in 2019. The three distances have separate starts, with a “Hikers” start an hour before the regular half marathon start. This is for slower runners who want the extra time, and is also used by runners who want an earlier finish. Hikers are not eligible for age group or overall awards. The course for Bay Breeze is very simple, out and back. But Brazen marks its courses well, has course marshals at key points (not many for Bay Breeze), and has “Mile #” signs for each distance along the course. Brazen’s aid stations offer a wide variety of liquids and snacks. Water and electrolyte drink are always provided, and Coke and ginger ale are also usually available. Snacks include a wide variety of candies, Payday and Rice Krispie Treat candy bars, cut up bananas and oranges, Oreo cookies, chips, and pretzels. That I can remember. If this sounds pretty much identical to my past Raves’ descriptions of aid stations, that’s because Brazen is VERY consistent. The goodies are great, but for me the best part of Brazen aid stations is the very cheery and encouraging volunteers. There is always one or two experienced aid station workers at each station, so things are generally well organized, allowing the volunteers to encourage and cheer on runners while keeping the goodies flowing. Bib: Brazen doesn’t do plain race bibs. Bibs usually have some sort of distance color-coding. 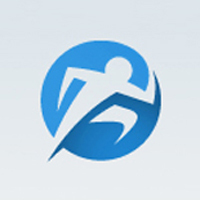 There is artwork in the background (often shared with the race T-shirt) with, running from top to bottom, the race name and date, bib number and runner’s name, and Brazen Racing’s logo. The background artwork for Bay Breeze 2019 was an octopus playing guitar to serenade his love (Valentine’s Day meets sea creature!). T-Shirt: Brazen’s registration fee includes a tech type T-shirt for half marathon runners and a poly-cotton T-shirt for 10K and 5K runners. 10K and 5K runners can upgrade to a tech type Tee for a moderate fee (currently $7), which I did. The tech type race T-shirt for Bay Breeze 2019 was RED (as it has been for several years) and long-sleeved. The front has the serenading octopus-of-love and guitar. The back features the artwork of a previous year, the octopus holding a bouquet of red roses for his love. The back also has sponsors’ and Brazen’s logos. Finisher’s Medal: The medallion is a large red heart with the guitar-playing octopus-of-love in front of it, and the race information at its bottom left. The ribbon has multiple red an white stripes, with the race information in blue outlined white and blue hearts running along the length of the ribbon. Finish & Recovery Area: Not only did it rain lightly and briefly on race day morning, it also had rained on several days the previous week. The start/finish area is all grass, except the ground was saturated, which resulted in the lanes into and from the arch being churned into mud. I saw a couple of people on Facebook who mentioned slipping and falling just after finishing, which I came close to doing. Not dangerous, just part of “rain or shine”. Brazen does not skimp on recovery area food – candies, cookies, cakes, chips, and cut up fruit, probably 3X the variety offered at aid stations. Brazen’s “signature” finish area snack is several flavors of It’s It ice cream sandwiches. I usually go for the mint ice cream, and occasionally strawberry. It’s It recently introduced a “Chips It” sandwich, which uses chocolate chip cookies instead of oatmeal cookies. The Chips It is also not coated with chocolate. I tried and liked the Chips It. My Results & Opinion of the Race: Brazen is one of the best race organizers in the SF Bay Area, always an excellent race experience (I’ve done 38 Brazen races in the past 5 years, so I’ll make that generalization!). Bay Breeze 2019 was all that. Bay Breeze is the first of a two-race series, and those who do the second race two weeks later, Victory, receive a connector medal that combines the two finisher’s medals into one really large “mega-medal”. I’ll be doing Victory, and doing Summer Breeze (same courses as Bay Breeze) is a possibility. This is the third year that I’ve run this race. The race starts at the San Leandro Marina and takes you down the Marina Bay Trail towards the San Mateo Bridge. You turn around about a half mile before you hit the Hayward Shoreline Interpretive Center, and head right back up the same trail to the marina. There’s absolutely no way to get lost on this course. It’s almost completely flat. If there’s any challenge at all, it’s that the trail becomes unpaved on the southern half of the course, if this is the sort of thing that slows you down. I personally prefer to wear shoe gaiters for this race just to keep the gravel and pebbles out. Because the Marina is so spacious, Brazen invites a lot of vendors to set up their booths, so this race has a little more to do afterwards. There’s also plenty of parking, although if you show up later you will probably have to park a mile away near El Torito! Plenty of aid stations, plus the post-race smorgasbord of awesome snacks. Bay Breeze is the winter edition of this popular course. If you’d rather do this when it’s warmer, Brazen also offers the identical course in the summer in the Summer Breeze race. Nearly all paved, and totally flat, this is a course for speed records! Well stocked for runners, there are 4 aid station stops on the 10k course – with all the goodies one generally finds at a Brazen race – fresh cut fruit, water, Ultima Replenisher electrolyte drink, chips, candy, pretzels, Gu…all sorts of stuff! This course also has port-potties near the turn-around, for those that had too much coffee before the race (me…yep…I did that!!). The trail is fairly wide, so there’s no issue when faster runners are on the way back, while those with a more relaxed pace are still on the way out. And then there is the view of the water…so peaceful, so beautiful! The views of the Bay are worth it! 10k and half are flat with some paved but mostly packed dirt. The views of SF and the planes flying over are great. The first time I ran it it was super foggy – making it boring, but if the weather cooperates you are in for a treat! This is a really easy flat race out at the San Leandro Marina with views during the entire race of the San Francisco Bay. Starts in a park area and can get a little muddy at the start/finish, but the other 99.9% of the race is on paved path and gravel path. This year had the most amazing rainbow (double, even) to start us off. Just a tiny amount of rain before the race started, but none after that, and when the sun came out it was really nice!! This is a very popular race because of its location and how flat it is. There are plenty of aid stations in the half (they also do a 5k and 10k). I would recommend this race for any new runners, or seasoned folks looking for a PR. Great flat and fast course! This is my Brazenversary race, 4th time running here. This year, I ran the 10k. The last two years , I ran the half marathon. Still have not run the 5k here, yet. Nice flat and fast course which runs along the San Leandro Marina right next to the SF Bay. The course is mostly paved. There is some gravelly sections. Brazen has top quality medals for all finishers and the top three in each age group get another medal, too. Tech tees for half marathon runners and cotton tees for 5k/10k runners. Always love their shirts. Post race refreshments consist of bagels, fruit, candy, salty snack, pastries, cookies, and an It’s It ice cream. You will not leave hungry. Plenty of aid stations on course. They are stocked with water, Ultima Sports drink, Gu, salty snack, candy, etc. Great race production. Will run again. This is the first race in the (Bay) Breeze to Victory double medal. If you run both races, you will receive a joiner medal that will connect the two and you will have a Mega-medal. The route was flat, weather was nice and it was along the waterside and view was beautiful. A group experienced pacers helped people to achieve the goal time. This is becoming a Valentine’s Day (ish) tradition for me and my spouse. Love the octopus and hearts theme. Super easy course, although wind can be a minor factor. Grand views and great location. Lots of parking around, just be prepared to walk a little). Past two years the start/finish area has been really muddy, but overall the course is dry and mostly paved. A nice chill race, with awesome swag! This race should be called the bridges and breeze since there are so many bridges on the half. All distances are flat and fast with great refreshments, shirts and medals. My descriptions of the Bay Breeze course in previous Raves are good, so I’ll just say that the 10K and half marathon courses are out-and-back along the Bay Trail, mostly exposed (sunscreen time, even with overcast!). This is one of Brazen’s more popular races – not hilly, easily accessible, good parking availability, usual great aid station snacks and recovery area food. Size does not strain what Brazen produces, from a participant’s point of view. The 2018 running was above average warm, in the mid-upper 60s and somewhat humid. Heat and I are not amicable running partners. So, why do a Rave when I’ve Raved Bay Breeze before? We-e-e-e-ellllll this wasn’t my best day on the trail. I signed up to do the half marathon distance, but when I was approaching the mid-point turn-around I realized that I probably had the “gas” to do only 9 or 10 miles, but not the full 13.1. At the turn-around was an aid station. Brazen cares about its runners (and walkers) and aid station volunteers are told to keep an eye on runners’ condition. Usually that means the usual encouraging chatter, which lets volunteers see how “with it” the runners are. It’s fun for all with a purpose (BTDTGTTS, literally). So, after resting for a bit to see whether that helped, I decided I’d best drop out at that point. After a bit of chat with the volunteers, they made sure I really was basically OK and contacted the RD to let them know what was happening. What would ordinarily have happened next for me would probably have been that I would help them at the aid station (that would have been my choice) until the Sweeper came, and then I would have gotten a ride back to the finish area with a volunteer. As things happened, a couple of volunteers (a Dad and Daughter) were going to be leaving early (to join the Mom who was doing the 10K), so I walked with them the half mile or so to their car and had a pleasant ride with them, getting to know them some. The normal protocol in situations like that is that the runner dropping out checks in with the RD to let them know (s)he is OK and not out on the course. Brazen keeps track of and cares about who is still out on the course. With Brazen, if a runner drops out of, for example, the half marathon but has completed 5K or 10K, they get a finisher’s medal for having done that. The half marathon turn-around being at ~6.5 miles, I did an “ultra” 10K. Brazen finisher’s medals are always great. Bay Breeze combines sea creature and Valentine’s Day themes, so the 2018 medal had an octopus (The Octopus of Love!) with a bouquet of red roses. As for doing Bay Breeze again? I will be Bach, errrrrrr back. This is an easy course if you are looking to PB or PR. I enjoyed the amazing views along the course. Race was well organized with great support.